Japan Moves Closer to Beijing-What Are the Consequences? This should be big news-but it won't be until the consequences become obvious. The new left leaning Democratic Party government in Japan is moving towards Beijing. They can see the writing on the wall-an Obama government seemingly intent on bankrupting his own country and unlikely to lift a finger against any Chinese aggression in Asia or the Pacific. An increasingly powerful China, long admired by many of Japan's anti-American elite. Unless reversed, this building re-alignment will have serious implications for Korea, Taiwan, the whole Asia-Pacific region and eventually the planet. BEIJING, Dec. 10 -- Ruling parties of China and Japan on Thursday pledged to deepen trust and work together for a stronger strategic relationship of mutual benefit between the two countries. 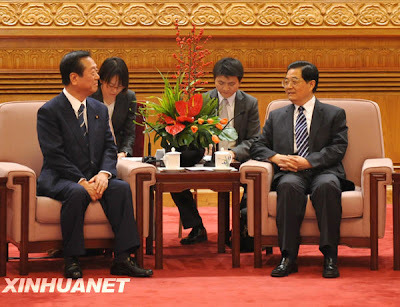 The pledge came out of a meeting between Chinese President Hu Jintao and Secretary General of the Democratic Party of Japan (DPJ) Ichiro Ozawa in Beijing on Thursday afternoon. Well the japs might want to remember how badly they treated china, I can guarantee the children of that slaughter remember . Thanks for your lovely posting. I really enjoyed reading it. I really liked your blog! Please come visit my site Directory Washington City when you got time. I really liked your blog! Please come visit my site Washington Business Services And Classifieds when you got time. ASEAN expands exactly in the same way as the formation of the EU. Have you noticed the consistent drive towards getting rid of or changing NZ's flag? ASEAN we are bonded as one"
I'm not surprised about the link between Japan and China. When I was a kid, my grandmother basically said that some day, Japan would take over the United States from within, considering the massive debt we have with China. How ironic and almost eerily prophetic. You owe a very nice and interesting blog. Please come visit my site Business Services Web Directory Of Seattle when you got time. You owe a very nice and interesting blog. Please come visit my site Free Business Listing of Seattle when you got time.